Michigan State was the defending National Champion and riding a 28-game winning streak, and it would leave Ross-Ade and run the table on the way to a Rose Bowl win. Meanwhile the our heroes were 0 and 4 and wouldn't win another game until the season ending Old Oaken Bucket clash with Indiana. 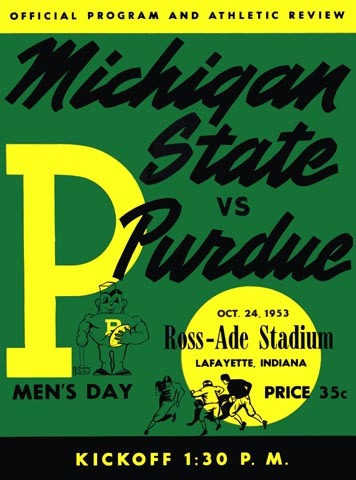 So naturally---naturally---the Boilermakers sent the Spartans back to Sparta without a single point as consolation, in perhaps the most stunning upset in Purdue history. The surviving Boilermaker fans are still pinching themselves over this one.